The wait is finally over!!! 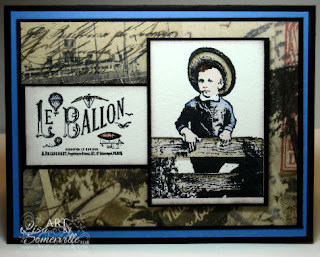 Artistic Outpost's January Releases Paris Exposition and Birds of a Feather are now available! Both collections are available unmounted or pre-cut and mounted on EZMount cling foam. Use coupon code Spring2010 at checkout to receive 20% off each of these two new collections purchased together or individually. Note - coupon expires January 26th. If you're reading this at a later date, click here to save 10% on all your purchases at Artistic Outpost. Paris Exposition: Inspired by the Paris Exposition of 1889, for which the famed Eiffel Tower was built, this stamp collection features bold vintage style images including a French version of "What's up?". In French, we translated it to be "Quoi de nuef?" There are several collage elements to this collection which will provide you the flexibility to add multiple layers to your creations. Just a quick card stamping the focal image in Black Archival on Watercolor paper, then coloring using the marker Watercoloring Technique. Birds of a Feather: Edwardian romanticism inspires this collection of bird images. Included is a perfect ATC background of German text. You will also love the engraving realism to the main bird images. For this card I stamped the "sisters" in Black Archival, then masked them with Eclipse Tape, and stamped the background, coloring my images with the Marker Watercoloring Technique, sponging the edges in Soft Suede. On my background paper (SU Retired), I randomly stamped the images from this set in Creamy Carmel, then the background image in Close To Cocoa, to add some interest to the paper. 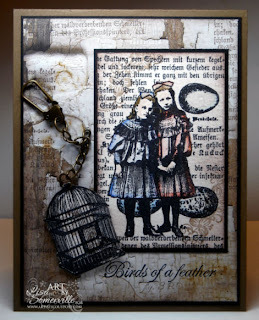 The birdcage was stamped on Watercolor paper, sponged, then added to the card using dimensionals and a Swivel Chain from the Idea-ology Line. Lisa, gorgeous projects. Love the tone of the cards. looks Awesome Lisa Love all the new samples! gorgeous cards Lisa!! I love the one with the sisters. It has so much to look at, yet isn't a cluttered card. Just beautiful!! I love what you did with the bird house & chain. These are beautiful cards for the new release, way to go Lisa! These cards are just gorgeous! I love how you put them together! Just perfect! And that bird house and chain is awesome!!!! That Bird of a Feather card is absolutely stunning, love it! The colors are fabulous....and that watercoloring technique is perfect for the images. My favorite is the one of the little girls. There are interesting aspects everywhere! Beautiful projects - love these new sets! Gorgeous...love the style, the artistry, and the way the images look so crispy. Beautiful.